This chapter deals with the concept of leisure. 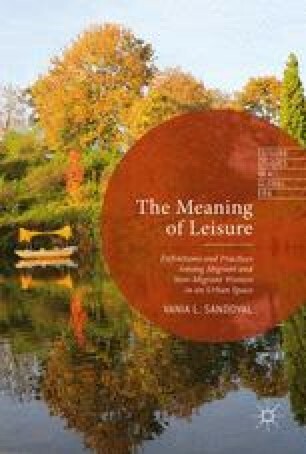 It shows how the conceptualization of leisure is a multidimensional process: an interplay between ideal leisure and experienced leisure. The chapter shows which criteria the women use to define leisure as ideal or “only” as leisure experienced in everyday life. For the latter, it is shown how certain experiences are not easy to define because boundaries between leisure and nonleisure are not always identifiable—for example, in the case of social obligations. The need to analyze the interplay between the two dimensions and their consequences for practices is emphasized. Badischer Sportbund. 2014. Mitgliederstatistik. http://www.badischer-sportbund.de/DERVERBAND/Wirueberuns/Mitgliederstatistik/. Accessed October 6, 2014. Fuller, Chris. 2011. Timepass and Boredom in Modern India. Anthropology of This Century, 1. http://eprints.lse.ac.uk/38021/. Accessed June 16, 2016. WeltN24. 2013. Gericht Erlaubt Kopftuchverbot im Fitnesstudio. http://www.sueddeutsche.de/panorama/urteil-in-bremen-kopftuchverbot-im-fitnessstudio-ist-rechtens-1.1705639. Accessed December 16, 2015.